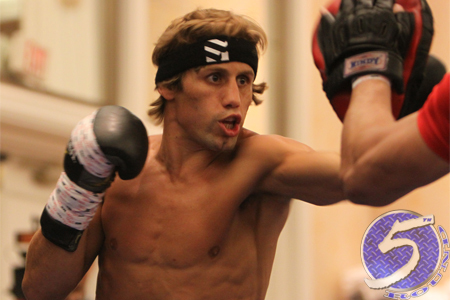 A featherweight bout between Urijah Faber (Pictured) and Ivan Menjivar was the third scrap to air live during Saturday’s “UFC 157: Rousey vs. Carmouche” pay-per-view broadcast. Honda Center in Anaheim, California is hosting tonight’s festivities. The show is headlined by a bantamweight title tilt between champion Ronda Rousey and Liz Carmouche. Menjivar hip tosses him to the mat, but Faber reverses and ends up in side control. Menjivar brings him into his full guard. Faber raining down some vicious elbows. Menjivar nails him in the grill with an upkick. More violent elbows by Faber. Menjivar scrambles to his feet, though Faber jumps on his back. He locks in a standing rear-naked choke. Menjivar is forced to call it quits.